This is a picture I took in Torrelles de Llobregat. 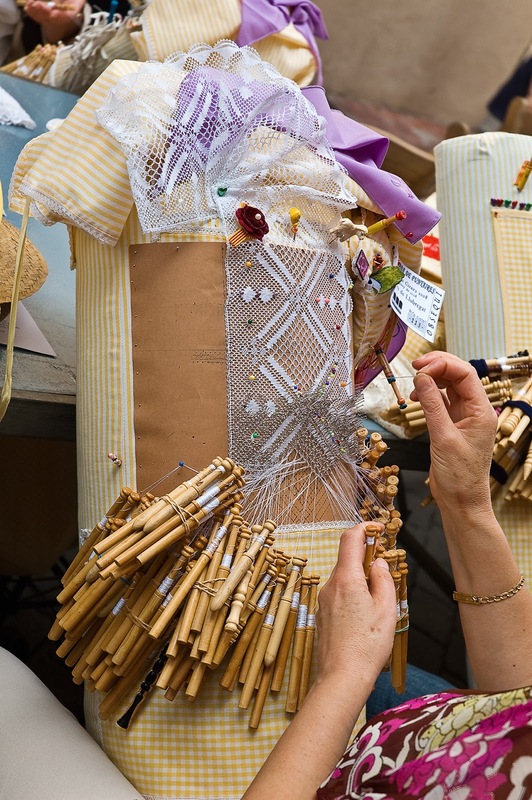 You can see here in detail how bobbin lace, known in Spanish as encaje de bolillos, is made. First you need a pattern or parchment where holes are pricked to mark the place for all the pins. The parchment is always laid on a pillow or cushion. The lace is worked with each hand holding at least a pair of bobbins, the wooden elongated spools or shuttles hanging from the threads, which are moved from side to side to form a twist, a braid, or a clothlike fabric called toile. The motifs are worked in a more dense stitch, and the ground is made with a looser stitch. Bobbin lace originated in Flanders in the early 16th century although some say it came from Italy. From Flanders it extended to the rest of Europe. It was used for ruffs and collars back then. In Spain it was customary to teach girls how to work bobbin lace at school and at home as it was considered an essential part of a woman's education. Check this video about bobbin lace. It is short and not too illustrative but it has a brief explanation in English that might help. Gracias Dsole. Me alegra que te traiga gratos recuerdos. Saludos.